Our selections by artists working in the 19th century includes the ever-popular Anonymous, hard at work in a number of different genres and with results varying from work to work. Some are no more than a travel record, others quick sketches from life, others still, ways of thinking about possible ways to lay out a composition, yet still others finished works of art serving not only as a model for another work but as independent, polished pieces capable of standing on their own (see particularly the portrait of a young woman on the "Portraits" page.. Some of these artists are anonymous because they never had any desire to be thought of as artists; others because they feared that the little they knew about how to draw could serve to help them remember something they wanted to remember but feared that publicly releasing them might bring them unflattering public attention. Others are by professional artists, sometimes continuing a long-time family trade, sometimes immensely successful, sometimes barely known, whose drawings were meant to serve as a resource to them and to their assistants. In some cases. the works are signedpossibly for presentation; in other cases the style presents a signature almost as reliable as the thing itself. We have identified works by Hans (Johann) Beckmann, Theophile Chauvel, Heloise Suzanne Colin, Felix O. C. Darley, the Count D'Orsay, E. F. Gehme, Otto Griner, Emil Kinkelin, Johann Mader, Mauer, Lothar Meggendorfer, Samuel Prout, Adrian Ludwig Richter, Marianne von Rohden, and Adalbert Wolfe. Anonymous (German, active late 19th century), Coach and horses on the highway. 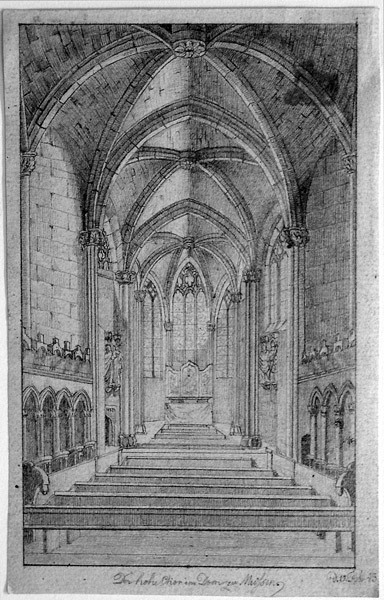 Pencil on wove paper, 1894. 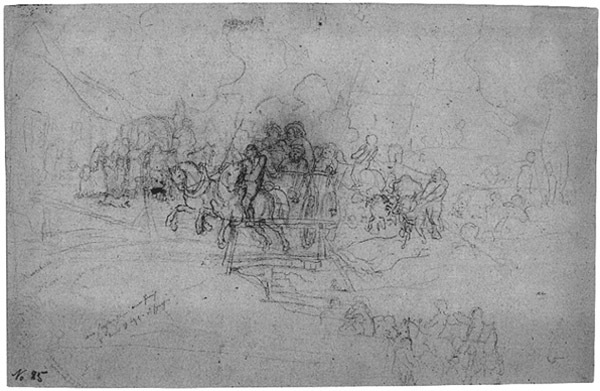 An impressively violent rendering of a coach and horses bursting through the center of the composition leaving the other travelers to fend for themselves. Image size: 170x272mm. Price: $475. Samuel Prout (English, 1783-1852), The High Choir in the Mussen Cathedral. 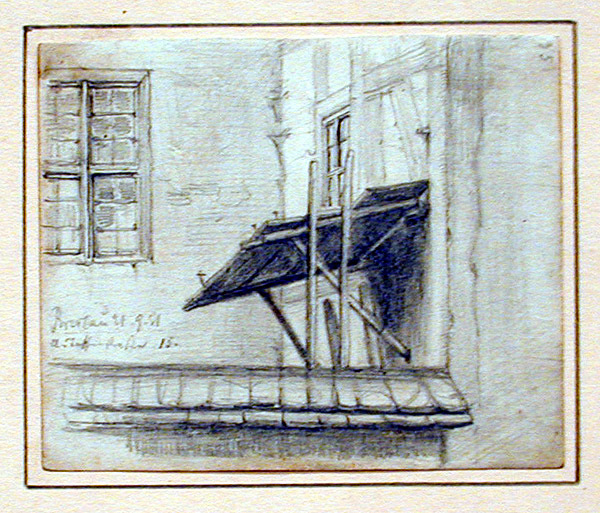 Pencil on laid paper, 1843. Titled and dated "12 Feb 43" in pencil lower margin center and right. Prout was one of the most inmportant watercolor artists in England during the 19th-century. His main interests seems to have been travel and painting, particularly church architecture. He wrote at least two books on painting, Hints On Light And Shadow, Composition, Etc. As Applicable To Landscape Painting ( London: Ackermann 1838, with 20 plates by the author) and Sketches At Home And Abroad. Hints On The Acquirement Of Freedom Of Execution And Breadth Of Effect In Landscape Painting. To Which Are Added, Simple Instructions, On The Proper Uses And Application Of Colour (London, 1844, with 44 lithographs by the artist). Shortly after his death he was the subject of an essay by John Ruskin, Notes By Mr Ruskin on Samuel Prout & William Hunt. More recently, he was the subject of a maor study, Richard Lockett, Samuel Prout (London: B.T. 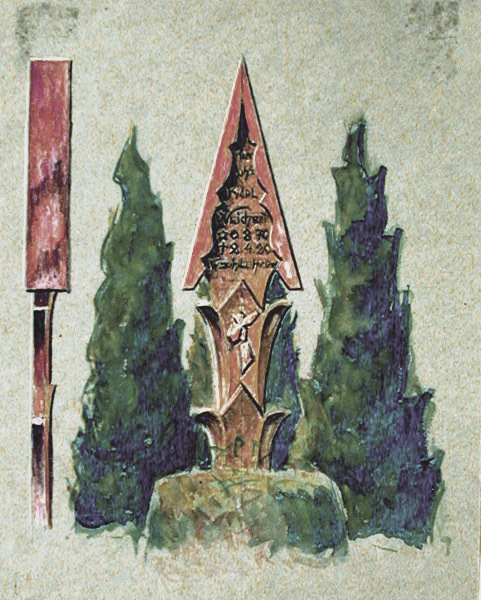 Batsford, 1985), containing 35 illustrations in b&w, 12 colored plates, and a Catalogue of 71 illustrations of watercolors and drawings in the Victoria and Albert Museum in London. Old tape stain top right. Image size: 158x101mm. Price: $1200. Alois Wolfe (Austrian, b. first half 19th c.), Breslau 21.9.81. Pencil heightened by chalk on wove paper, 1881. Wolfe attended the Munich Academy; he specialized in landscapes. 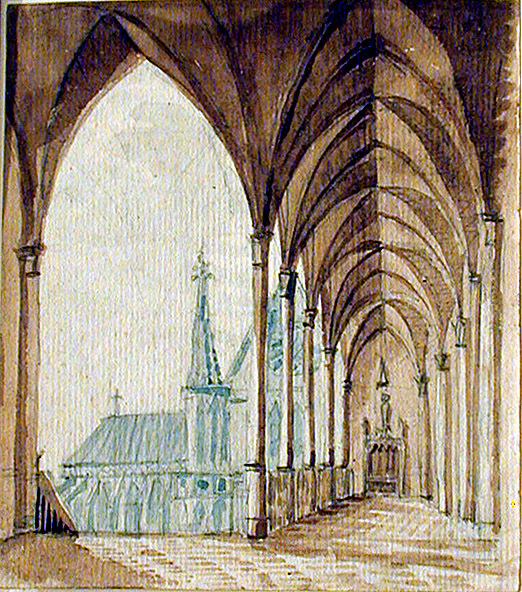 A beautiful little drawing of an architectural detail that seems to have caught the artist's eye. Image size: 82x98mm. Price: $400. Anonymous (German, 19th century), Gravestone for Hanni Weise 2-4-20 to 3-17-73. 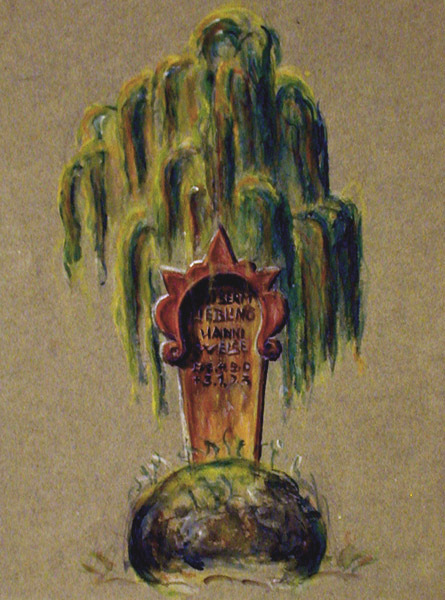 Watercolor and pencil on greentinted wove paper. Image size: 156x124mm. Price: $350. Anonymous (German, 19th century), Gravestone for Karl Weichout 6-4-70-2-4-20. Watercolor and pencil on greentinted wove paper. Image size: 156x124mm. Price: $350. To purchase, call us at 1-800-809-3343 (1-508-529-2511 in Upton MA & vicinity) or send an email to spaightwood@gmail.com. We accept AmericanExpress, DiscoverCard, MasterCard, and Visa. Visiting hours: flexible. Call for availability. Browsers and guests are welcome.